A blend of purified essential oil and natural herbs, Ortho Shakti is complete Ayurvedic oil. 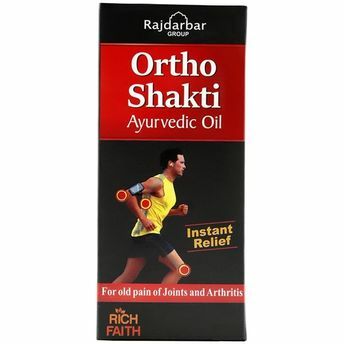 Purely based on the Ayurvedic ‘Jadi-butis’, the Ortho Shakti Oil is diligently curated from a combination of 10 natural ingredients which are highly effective in chronic joint pains & arthritis. Bringing along the goodness of Ayurveda, Ortho Shakti instantly acts upon the pain and offers relief in knee pain, elbow pain, shoulder pain, back pain, muscle pain, leg pain and joint pain. Sesame Oil: Rich in anti-oxidants, the oil is easily absorbed into the skin and promotes skin softness.